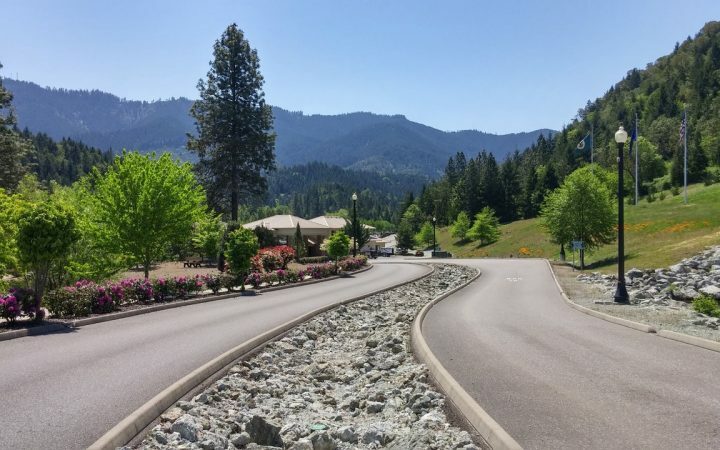 Located in the “Land of Umpqua” – and in the heart of the Umpqua Valley wine region – just off I-5 at exit 99, Seven Feathers RV Resort is situated on 23 acres of manicured lawns and lush landscaping making for a serene, relaxing getaway. Guests of Seven Feathers RV Resort and the adjacent Seven Feathers Casino, Resort and Spa are always treated to an outstanding experience. RV sites are paved, meticulously landscaped with patios, circular picnic tables and chairs and a mix of sun and shade. The RV resort offers 191 landscaped full-hookup sites, its own heated indoor pool and hot tub, fitness center, gift boutique, and a guest lounge complete with complimentary coffee and computers for guests to use. The park also offers family-style restrooms, laundry, clubhouse, barbeque pavilion, playground and fenced dog run – along with paved hiking and biking trails. When you’re ready to sit and relax, gather by one of our community firepits. 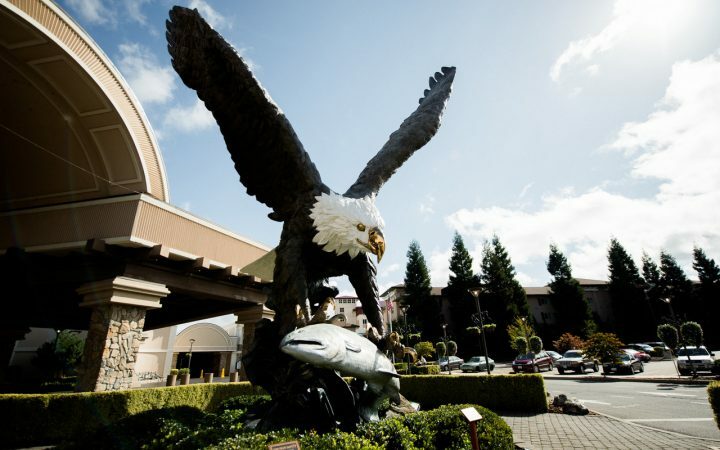 There also is a free 24-hour door-to-door shuttle to the Seven Feathers Casino Resort with its fine dining and casual restaurants, nightlife and lots of gaming choices, including a non-smoking area. 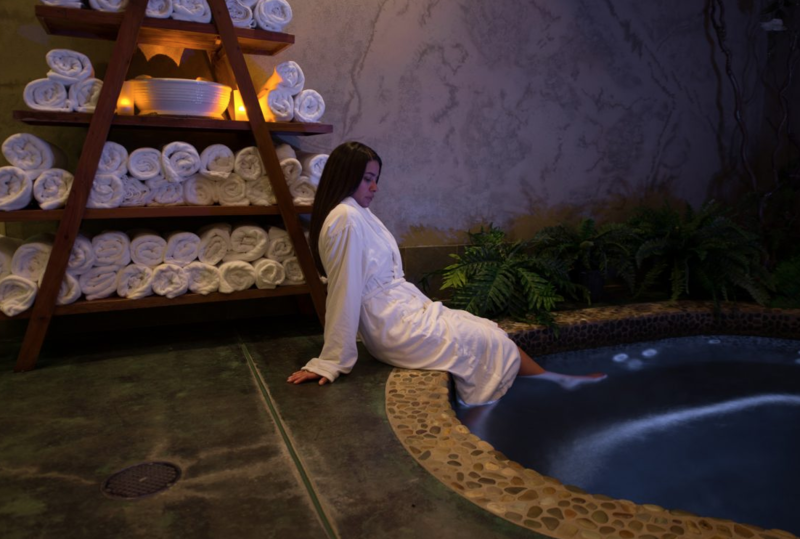 The full-service River Rock Spa offers the utmost in pampering and tranquility. 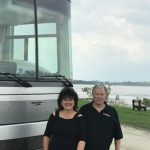 For exploration further afield, Seven Feathers RV Resort can help guests schedule wine tasting tours and tours to nearby attractions – such as the drive-through Wildlife Safari. And they haven’t forgotten golfers. Bring your clubs and take advantage of special packages at nearby Myrtle Creek Golf Course. Groceries, RV supplies, a Deli and ice cream are within walking distance at the Seven Feathers Travel Center that also has propane and diesel fuel. So, while we offer all of the conveniences of modern life, Seven Feathers RV Resort remains a quiet and pristine spot away from the hustle and bustle of the world. If you’re looking for a beautiful setting in the heart of a Southern Oregon canyon of fragrant Douglas Fir and Pines, look no further than Seven Feathers and let us welcome you to the Land of the Umpqua. You’ll be treated like family and we hope you will have an unforgettable experience that you will treasure always.